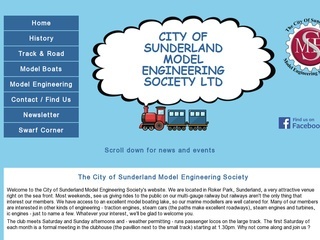 Welcome to the City of Sunderland Model Engineering Society’s website. We are located in Roker Park, Sunderland, a very attractive venue right on the sea front. Most weekends, see us giving rides to the public on our multi-gauge railway but railways aren’t the only thing that interest our members. We have access to an excellent model boating lake, so our marine modellers are well catered for. Many of our members are interested in other kinds of engineering – traction engines, steam cars (the paths make excellent roadways), steam engines and turbines, ic engines – just to name a few. Whatever your interest, we’ll be glad to welcome you.